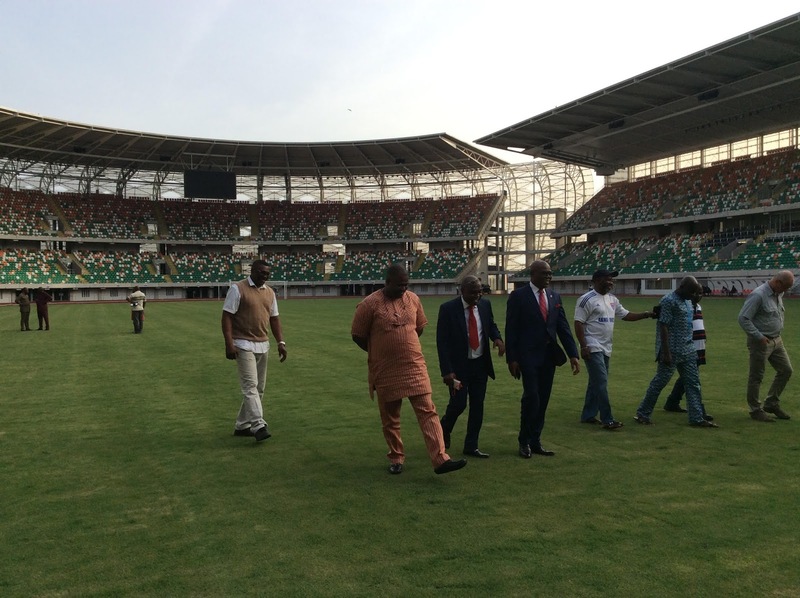 An inspection team led by the Chairman of NFF Technical and Development Committee, Barrister Chris Green has expressed satisfaction with the current state of the playing turf of Godswill Akpabio International Stadium, Uyo that is slated to host the 2019 Africa Cup of Nations qualifier between Nigeria and South Africa in eight weeks’ time. Green, alongside NFF Deputy General Secretary, Dr. Emmanuel Ikpeme on Tuesday inspected the magnificent facility, nicknamed ‘Nest of Champions’ and which hosted the 2017 Africa Cup of Nations qualifier between the Super Eagles and Tanzania in September 2016, as well as the 2018 FIFA World Cup qualifying battle between the Eagles and the Fennecs of Algeria five months ago. “We are delighted with the state of the playing turf and other facilities at the Godswill Akpabio Stadium,” Green told thenff.com. “I can tell you that the pitch is just as it was when the Super Eagles played Algeria in the World Cup qualifier in November last year. Tuesday’s visit to the capital of Akwa Ibom State was to ascertain the condition of the playing pitch and indeed other facilities at the Godswill Akpabio International Stadium, as well as the level of commitment of the State Government to hosting the big match. However, in order to maintain the lush –green state of the pitch, the inspection team has advised that no activity be carried out on it until ongoing work is completed and the 2019 Cup of Nations qualifier between the Eagles and the Bafana Bafana is played. The ‘Nest of Champions’ will also play host to the 2018 FIFA World Cup qualifying matches between the Super Eagles and Cameroon’s Indomitable Lions (August 2017) and between the Super Eagles and the Chipolopolo of Zambia (October 2017). Also present during the inspection were Sir Monday Ebong Uko (State Commissioner for Youth and Sports), Hon. Akan Okon (State Commissioner for Special Duties), Mr. Aniedi Dickson (Permanent Secretary, Ministry of Youth and Sports), Mr. Emmanuel Iba (Chairman of Akwa Ibom State Football Association), Mr. Paul Bassey (Chairman of Akwa United Football Club/SSA to Governor on Sports), Mr. Victor Owokwure (the Stadium Manager), representatives of Akwa Ibom State Sports Council and representatives of Julius Berger construction company.